alternative medicine based on the idea that the ear is a micro system, which reflects the entire body, represented on the auricle, the outer portion of the ear. 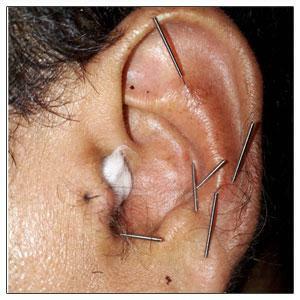 Conditions affecting the physical, mental or emotional health of the patient are assumed to be treatable by stimulation of the surface of the ear exclusively. Similar mappings are used in many areas of the body, including the practices of reflexology and iridology. These mappings are not based on or supported by any medical or scientific evidence, and are therefore considered to be pseudoscience.